The program "TANALYS" (Topographical ANALYSis) is a basic tool for preparing data for WaSiM. Based on an digital elevation model (DEM), the tool automatically creates most of the required spatial model input like slope, aspect, subbasins, flow routing channels etc. 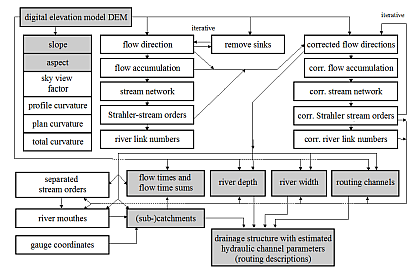 The following chart shows the processing schema as an overview. Grey shaded data sets are ready to be read in in WaSiM. Tanalys collects a number of complex derivative processes, it is fast and reliable. The program is controlled by a control file (similar to WaSiM itself). the control file can be used for defining the types of analyses to be performed and to set certain parameters (e.g. thresholds for flow accumulation to create a river cell). A detailed description of TANALYS can be found in the respective chapter of the WaSiM documentation.